Resources are dwindling. Overpopulation is destroying the planet. Time is running out. Elite factions are exploring the cosmos for a new home, new technology, new allies, or the resources needed to repair the plight of their damaged homeworld. With nothing left to lose and on the brink of madness, these warring Earthlings, equipped with deep-space warships with expansive cargo holds, will do whatever it takes to claim the glory for saving humanity...before the Earth explodes! 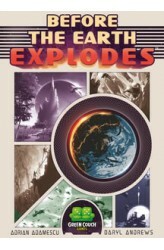 In Before The Earth Explodes, two players face off with the use of simultaneous action selection, clever tactics, and intuition to be the first player to advance to the top of the technology track, colonize seven new planets, destroy the opposing faction, or meet one of the ship victory conditions. htt..
Get in the driver seat and feel what it's like to live the life of a sweet treat trucker! Stock up your truck, attract customers, and serve a hefty scoop of tasty frozen delight! The best truckers get to know their customers' favorite selections so that they can always meet demand and gain an edge over the competition in the battle to claim the hottest locations. You'll see the business of icy entrepreneurship is no day at the beach. Buckle up, turn on the loudspeaker, and take to the rocky road...with ice cream! 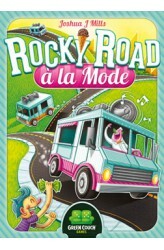 Rocky Road à la Mode is a game of managing time and resources to meet the demands of sweet-treat-seekers! The game features multi-use cards and a time track that determines the players' turn order. The player whose ice cream truck is furthest back on the road goes next..